Dogs respond well to routine. This doesn’t mean that your new puppy needs a therapist because they are resistant to change. This simply means that dogs like to know what to expect, and what is expected of them. When your dog starts training, they need to be instructed about what to do. A training treat needs to be tasty to your dog, because the idea behind reward training involves the dog wanting the reward. The more your dog wants the reward for obedience, the more receptive they will be to learning your commands. If you are teaching your new dog a command, they aren’t going to be too enthusiastic about doing so if you try to tempt them with a treat that tastes like cardboard. Canines have impeccable senses, so the minute you take out the treat you’re going to use, they will be able to smell its aroma, and they will know straight away if you’re trying to entice them with the doggie equivalent of lettuce or steak. It’s going to be difficult to get your dog into an obedient mindset if they don’t want the treat being offered, so a tasty treat is one of the first steps to making progress with your training regime. 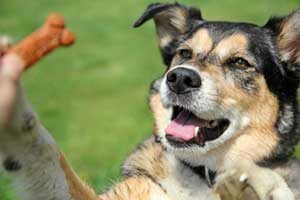 Taste is the number one factor when it comes to choosing an effective dog training treat, but you also need to make sure the treat you choose is practical. If you can’t bring treats with you when you take your dog for a walk or on a trip to the vets, it isn’t a good choice. The treat you use for dog training needs to be easy to use and easily accessible. As dog training progresses, commands become more complex. Commands like ‘heel’ are taught at a later stage than ‘sit’. 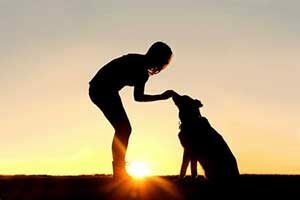 Some dog owners are content with getting their dogs to sit, for others want to have a companion they can trust to behave appropriately in high stress situations. If, for example, you’re out walking your dog and want to get it to heel before crossing the road, having treats in your pocket could help to ease the potential stress of the situation. Because of this, dog training treats, particularly during later stages of dog training, need to be compact enough to fit in your pocket, because unzipping a purse or backpack is too awkward and time-consuming when you’re out with a dog that is still being trained. The size of the dog training treat is another important factor to consider when deciding what’s best for your dog. Dogs should only consume a limited amount of calories per day, depending on their weight. On average, they need approximately thirty calories for every pound they weigh. This differs slightly depending on their size and breed. A smaller breed that is hyperactive can require forty calories per pound, while a larger, more docile breed may only need twenty calories per pound. The best way of determining if your dog is consuming the right amount of calories is to weigh them regularly. If your dog needs to lose some weight, you can either feed them less or increase their physical activity. 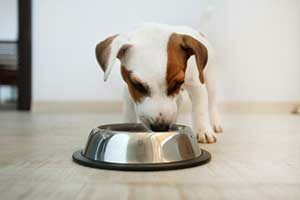 If your dog is on the thin side, simply put a bit more in their food bowl. As a responsible dog owner, you will need to factor in their dog training and the amount of treats they get on a daily basis when trying to assess their daily calorie intake. It is essential to be aware of the amount of treats your dog gets on a daily basis to make sure you don’t overfeed them. If you’re doing training with a lot of treats, you’re going to have to reduce the amount of food in their main meal. You also need to consider that dog food is often going to be more nutritionally balanced than a dog training treat, so treats shouldn’t take up too much of a dog’s diet. Because of this, it is important to take dog training seriously, but not to go overboard. Using dog training treats that can be broken into more than one portion or ones that have a lower caloric count will ensure that your dog gets trained while also staying healthy. Packed full of natural ingredients, the most important of which is chicken, Zuke’s treats are bite-sized, which allows for high impact training. Another very competitor, Wellness Soft Wellbites contain no corn, soy, artificial colors, or additives. They come in a variety of flavors including chicken and lamb, lamb and salmon, and chicken and venison. Specifically designed for dog training, the Pet Botanics Training Rewards are recommended by thousands of professional trainers. They come in the perfect size to make sure that you can repeat commands when training without overfeeding your dog. Rocco and Roxie jerky sticks are low calorie treats that dogs really love the taste of. They can be torn into many training rewards, as one stick is too big for just one treat, so they work for dog training in that they’re easy to carry around and use.